A healthier alternative! 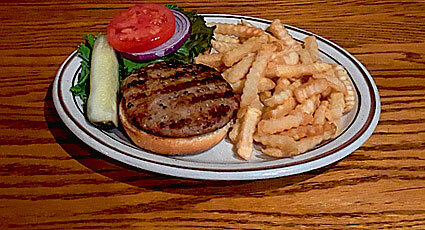 Seasoned ground turkey grilled and served with red onion, lettuce and sliced tomato on a sesame seed bun. 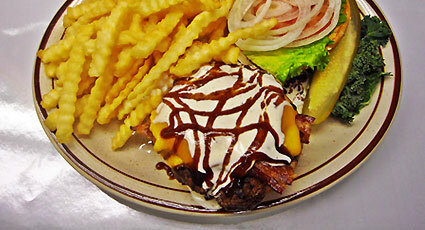 A 6-ounce portion of the finest ground beef charbroiled and served with lettuce, tomato, and onion. 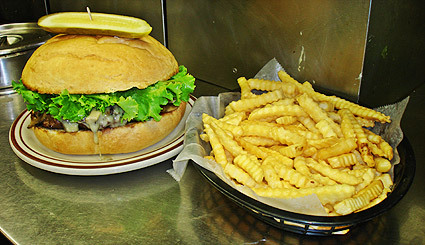 A 6-ounce burger topped with sautéed mushrooms and Swiss cheese. A 6-ounce burger charbroiled and topped with all of the above. A one pound hamburger that will feed one or more. Served with a mountain of fries.